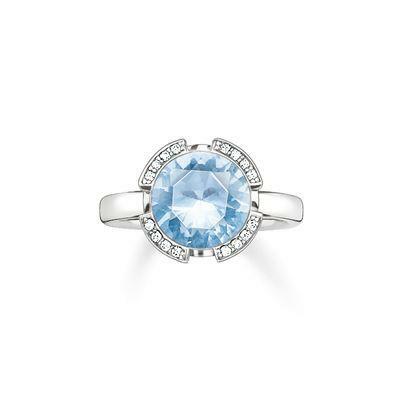 This stunning ring from the Thomas Sabo Sterling Silver collection makes a statement with a dazzling sky blue synthetic stone beautifully embellished with glistening white cubic zirconia. The faceted cut of the stone adds a bright sparkle against the 925 sterling silver setting that is styled with the TS initials lending the classic claw shape a modern twist. Wear this fabulous accessory as a statement piece by itself, or stack it with other rings from the collection for ultimate glamour.